It is a truth universally acknowledged, that a Norwegian man in possession of much torsk must be in want of variety. Cod is plentiful in northern waters, making it a staple in the Scandinavian diet. If you have had more cod–or torsk, as the case may be–than you think you can stomach in recent years, let me urge you to give this simple yet versatile fish a second chance. Simply wrap it in bacon and serve it alongside a classic Scandinavian cucumber salad and some herb-roasted vegetables, and you’ll have a dinner fit for the most jaded palate. The fatty, smoky aroma of bacon permeates the air as the cod cooks, and whose nose can’t follow the smell of bacon to the kitchen? When everything is served, the classic white-on-white meal of cod and potatoes is nowhere to be seen. 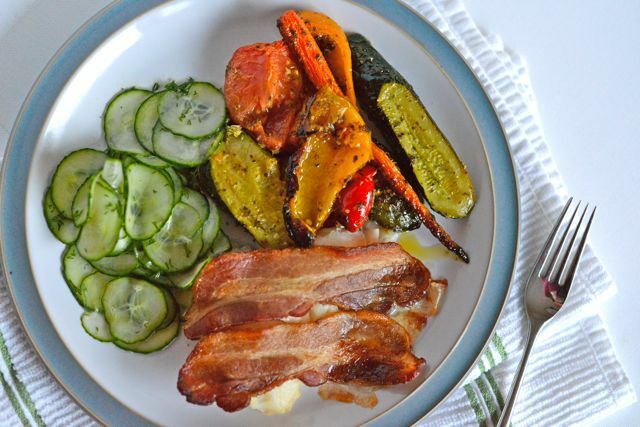 Instead, a rainbow of colors is splashed across the plate, with red tomatoes, red, orange, and yellow bell peppers, green zucchini and herbs, and brown and pink bacon. Rounding out the bold and hearty flavors is a crisp, tangy, and fresh cucumber salad, standing in as the modest yet predictable anchor in this Scandinavian–yet decidedly original–meal. This recipe–which would probably be better described as a technique–is adapted from The Scandinavian Kitchen by Camilla Plum, and is about as simple as you can get. Make it once and then file it away under ideas for what to make when a you’re a guest somewhere and can’t remember quantities–because you don’t need them! Preheat oven to 400 degrees. Butter a baking dish and place the cod inside. Sprinkle a light touch of salt over the cod, and then drape strips of bacon crosswise, covering most of the cod. Bake until cod is cooked through and opaque and bacon is crispy, about 30 minutes depending on the thickness of the fish. I have included quantities here, but please treat them loosely and trust your own flavor judgment. Prep the vegetables: Cut bell peppers into thirds and remove the stem and seeds, then cut each segment in half again lengthwise so you have six segments per pepper. Remove the stem from the zucchinis, then cut each on a sharp diagonal into 1 1/2-inch slices. Peel the carrots. Cut the tomatoes into quarters or eighths, depending on their size. 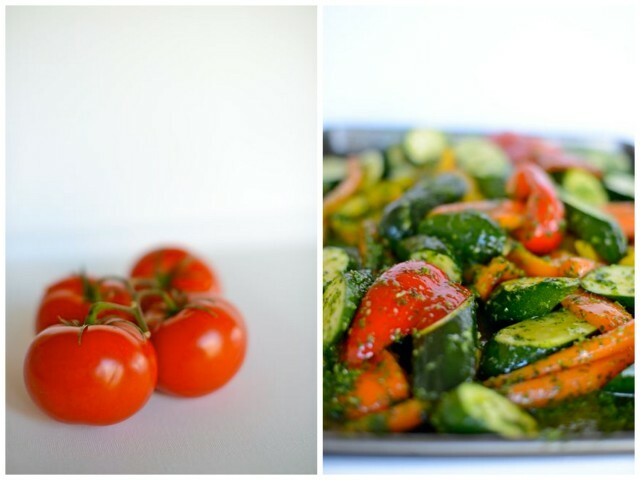 Scatter the peppers and zucchinis on a baking pan. Steam the carrots until tender, about ten minutes. Set the tomatoes aside. Make the marinade: Place garlic, parsley, rosemary, thyme, salt, and olive oil in a food processor and pulse until chopped and combined. Taste and adjust seasoning as needed. 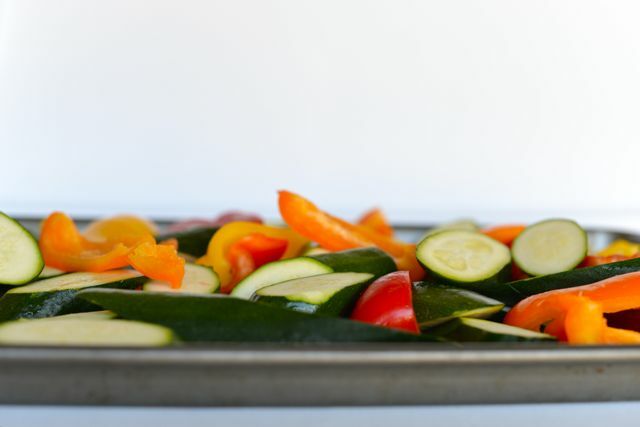 Roast vegetables: Add steamed carrots to the peppers and zucchini on the baking sheet, and toss with the marinade. Roast on the center oven rack for 20 minutes, stirring occasionally. Then add tomatoes and move the rack to the upper third of the oven and roast until the vegetables begin to caramelize in places, stirring gently so as not to break apart the tomatoes, about 15 minutes. Thinly slice the cucumbers using a mandoline and place into a medium bowl. In a small bowl, combine vinegar, sugar, salt, and a few grinds of pepper. Pour over the cucumbers and sprinkle with chopped dill. Cover and chill for at least three hours. 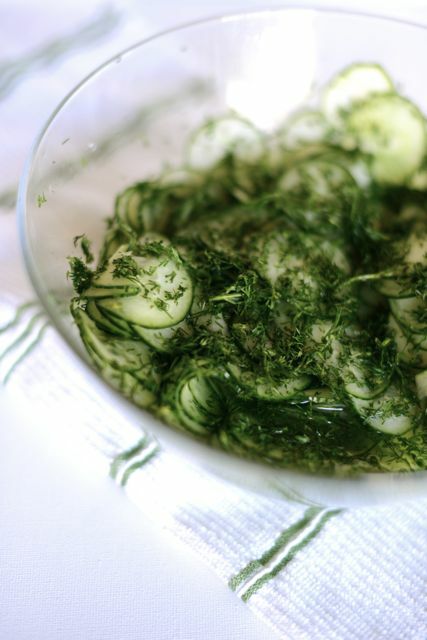 When ready to serve, stir the cucumber salad, drain the excess liquid, and garnish with sprigs of dill. I am so excited to have found your cucumber salad recipe! It has always been a favorite of mine at European restaurants, but I haven’t tried recreating it at home. Can’t wait to give it a go! Kimberly Ann–I’m so glad you stopped by! I hope you enjoy the recipe, and please let me know what you think if you try it out! Thanks! I hope you enjoy this version!